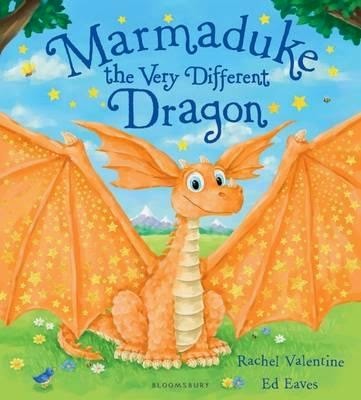 Marmaduke the dragon is a little different from the other dragons … okay, he's very different. The other dragons are purple with smooth scales and tiny neat ears. They all love to fly and each one has a princess to protect. Marmaduke, on the other hand, is orange with huge ears, and he never flies because his wings are rather unusual. So unusual, he doesn't want anyone to see them. His only attempt to protect a princess ended badly — she refused his offer of protection as he wasn't a 'proper' dragon. And as Marmaduke lies miserably in his cave, all alone and crying quietly, he has only one wish: that he wasn't 'different'. But, far away, someone else is very happy being different. While the other princesses are quiet with pretty dresses and neat hair, Princess Meg loves crazy dresses, has messy hair and loves to dance at every opportunity. No dragons want to protect her, but Meg doesn't think she needs one anyway — after all, who would want to steal her?! Then one day her dancing takes her further away from her castle than she realises. Suddenly, she's alone … in a wood … in the dark. And it's going to take someone with huge ears to hear her calls for help!